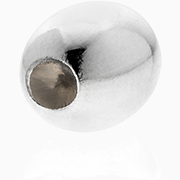 The core of FAOR’s work has always been the achievement of excellence and reliability of semi-finished findings for jewelry. In order to achieve this, FAOR has always focused on thoroughly researching the trends of jewelry design. This investigation has led to the creation of silicone findings, an original item with unique technical characteristics. 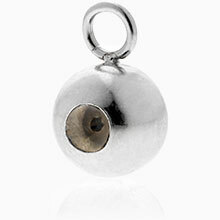 • Adjustment bead: a stress-free easy opening for effortless placement. • Separator between different elements (i.e. : silicone beads between bracelet charms). The use of a particular type of silicone, which is wear-resistant and harmless, allows a fluid, uniform sliding with frictionless movement on the chain. Neither loose nor rigid, this sliding is stress-free, comfortable and ergonomic, enduring for more than 1000 repositionings on the chain. The silicone injection method uses a highly advanced machine, which always injects the same amount of silicone in order to obtain products with the same unique and exclusive level of fluidity. This technique increases the production quantities of silicone beads, keeps the product price consistent and allows orders to be processed rapidly. 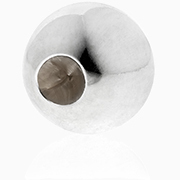 FAOR’s silicone products are high-quality gold or silver findings, perfect for jewelry with stones or beads. Clients have multiple finishing and design options, in fact FAOR’s silicone findings are available polished (in many sizes) but also “starlight”. 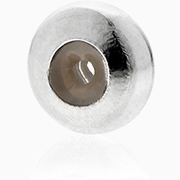 These beads are available in two versions: soldered together or with a soldered ring (adjustable bead slider). Laser soldering allows us to fulfill orders quickly and offer an aesthetically consistent product.